Use Vistaprint coupon codes for deals on full color printing services such as free shipping or free business cards. With Vistaprint.com coupons and promo codes, cheap printing services and many free deals are easily within reach. 40% off Invitations and Announcements starting at $0.46 each. Geeks often operate small businesses that require printing services, usually for marketing purposes, but, unfortunately, traditional print shops typically require excessively high numbers of print runs that the small businessman or woman just can’t afford. As luck would have it, Vistaprint boldly stepped in the gap left by the traditional printers to provide low volume print runs for the small business person. 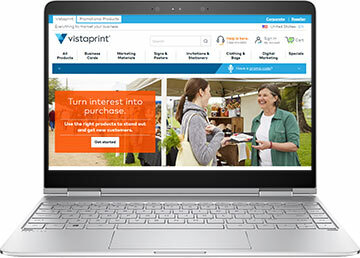 Seizing the opportunity of Internet technology, Vistaprint.com offers graphic design services through online design studios and makes it possible for anyone, anywhere to use their print and design services. You can also make and upload your own designs for printing. Vistaprint.com makes it possible for you to order and print the ideal quantity of business cards, postcards, brochures, flyers, or data sheets, or letterhead for your business. They’ll put your logo on all manner of promotional gear, from sticky notes, pens, bumper stickers, window decals, mouse pads, and hats to T-shirts, magnets, calendars, tote bags, keychains, and mugs. They’ll even provide your business with a toll free 800 number. You may be a computer genius, but perhaps programming’s more your thing than design. If so, you can take advantage of Vistaprint’s many services, including logo design, postcard marketing, website design assistance, email marketing, Internet marketing, and even credit card processing. You don’t have to own a small business to benefit from Vistaprint’s services, however. They also provide printing services for the home and family. Perhaps you need personal stationary, invitations, birth announcements, photo cards, thank you notes, holiday cards, or wedding invitations. Get the customized stationary and greeting cards you want – even add photos to them – for very affordable prices. You can even coordinate for a single event with a set – for instance, matching T-shirts, invitations, and thank you notes for a special occasion. Basically – if you need something, anything printed – this online full color printing service can do it for you. Whatever your need, you’ll receive high-quality, full-color custom printing, create your product in minutes, and receive it in days. So whether you need cheap business cards in low volume, or a photo calendar as a gift for grandma, log on to www.vistaprint.com and get started with ease.